The Mars Thermal Emission Spectrometer research group at ASU is busy compiling a spectral library of Earth's minerals and rocks for comparison to spectra to be obtained from Mars. The spectral library will also be useful for interpreting remote sensing data of Earth. For a short tutorial on what thermal infrared energy is, how we measure it, and why we use it for looking at rocks and minerals, see the What is TES? page. Our Nicolet Nexus 670 is shown below with the emission sample chamber on the right. An annotated version of this picture is available here. This new spectrometer allows us to obtain data from 4000-200 cm-1 (~2.5 - 50 microns). To learn more about our spectrometer configuration and calibration, please see Ruff et al. on the References page. 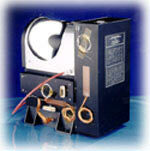 A picture of our previous Mattson Cygnus 100 spectrometer is also available. As part of our work, we have a separate laboratory for sample preparation. Separation of samples by particle size and mineral content is key to understanding the fundamental infrared signature of rocks. There are many people at the ASU TES facility who are engaged in active research projects involving the study of rocks and minerals in the lab and via remote sensing. Follow the links below to find out about some of these research projects. Since the Viking orbiters and landers returned a wealth of information about the Red Planet in the mid-1970's, scientists have been interpreting a great deal about the history of the planet's surface, sometimes augmenting the Viking datasets with other planetary and laboratory data. Go to our References page to see a list of some of the professional papers that have been written by ASU TES scientists. Everyone contributes to the ASU TES spectral library, which currently contains over 150 pure mineral samples, more than 100 rock samples, and six martian meteorites. This infrared emission plot shows the differences between the major silicate structural groups (noted below the mineral name). As the silicate structure becomes depolymerized (from framework through chain to isolated structures), the location of the short wavelength absorptions (between 8 and 12 microns) shifts to longer wavelengths. This provides a quick way of discriminating mineral classes. Silicates have variable structures, but all contain a basic Si-O tetrahedral anion; various cations are bonded to these anions to form minerals such as quartz, feldspar, mica, etc. Feldspars:Feldspars as a group are the most common minerals in the Earth's crust, occurring in many types of rocks. They are probably quite common in Mars rocks as well. The different varieties of feldspars cover a range of compositions and structures. These variations can be used to understand the conditions under which igneous rocks form. The ability to distinguish the different feldspars is key to this heightened understanding. Thermal emission spectroscopy is proving to be a capable tool for this application. See Steve Ruff's feldspar page. Pyroxenes:These mafic minerals are most commonly found in dark volcanic rocks, such as basalts. Much if not most of the martian surface is expected to be composed of basaltic or related types of rocks. If two or more pyroxenes are present in these rocks, their compositions can be used to determine the temperature and pressure conditions of the melt from which the rocks were derived. By making maps of pyroxene composition and abundance as a function of location and age, we hope to learn a great deal about the evolution of igneous processes on the surface and in the interior of Mars. To look at spectra of these minerals, see Vicky Hamilton's pyroxene page. Carbonates are based not on a Si-O anion, but on a CO3 anion. Carbonates, sulfates, phosphates, and chlorides are sometimes referred to as "evaporites" because often these minerals precipitate from water. The TES team will be looking for evaporites on Mars because, if detected, they may provide insight into the chemistry of water on Mars and how long it was available on the planet's surface to aid the weathering of the martian rocks and to interact with the atmosphere. Water is thought to be a critical necessity for the support of life, thus finding water-lain minerals may provide clues to where to look for biological material. See spectra on Melissa Lane's carbonate page or her phosphates, sulfates, and chlorides page. Until rocks are brought back to Earth from Mars someday, the only samples of the Red Planet that we have are the martian meteorites. Most scientists believe that these meteorites are from Mars due to special characteristics that make them different from all other meteorites and terrestrial rocks. All of these pieces of Mars are igneous rocks that are basaltic or ultramafic (containing mostly Mg-rich and Fe-rich minerals) in composition. To see the thermal infrared spectra of a few of these meteorites, go to Vicky Hamilton's martian meteorites page. Studies of minerals are very useful for learning about the spectral differences in minerals that can have variable structures or compositions, but in the natural environment, very few minerals occur alone in large quantities -- most minerals are found with a group of other minerals in rocks. Look here to see the spectra of some common igneous rocks and metamorphic rocks. Spectra courtesy K. C. Feely (Master's Thesis). Several research projects by ASU TES scientists involve remote sensing studies of locations on Earth, particularly in the desert southwest and volcanic provinces of the west coast of the United States. 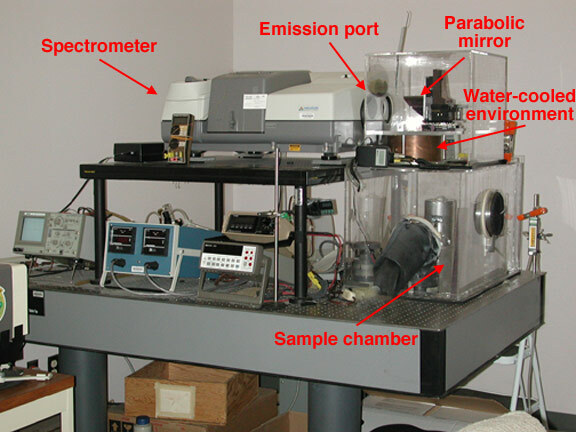 Much of this research involves the application of linear deconvolution, a technique which allows us to determine not only the composition, but also the abundances of minerals in thermal infrared spectra. Additional studies involve understanding hillslope sediment transport, soil development, and aeolian processes via the characterization of arid hillslope soils using remotely acquired thermal IR spectra, VIS/NIR spectra, and radar. This work also investigates the role of desert vegetation in sediment transport and soil development. See Will Stefanov's page about remote sensing of Arizona and the Geological Remote Sensing Laboratory homepage. The TES facility is also home to the Arizona State University Landsat Image Server, which contains Landsat data for the entire state of Arizona (accessible to students, faculty, and staff of Arizona State University). We are also involved with the City of Scottsdale, Arizona, bringing remote sensing to urban applications.